Author’s Note: If you would like the entire translation reference guide for your marriage certificate, it can be found here. If it’s handwriting help you are looking for, consider joining our Premium group – weekly access to live “office hours” where you can ask Katherine your tricky transcription and translation questions – and get immediate answers (also includes a download of the marriage certificate reference guide). 1. “Vor dem unterzeichneten Standesbeamten”: “Before the undersigned registrar”. This is often the beginning sentence of the marriage certificate, underneath the city and date it was issued. 2. “der Persönlichkeit nach bekannt/der Persönlichkeit nach _______ anerkannt”: “His (or her) identity known”/”His (or her) identity verified by_________”. In the first instance (bekannt), the registrar personally knows the individual and does not need a form of identification. In the second instance (anerkannt), the registrar verifies the person’s identity with a form of identification, filling in the blank with the ID that was presented. It could be a passport, birth certificate, baptismal certificate, military ID, etc. 3. “geboren den_____ des Jahres_____”: “Born on the (day, month) of the year____”. The year was usually written out in letters rather than numbers. 4. 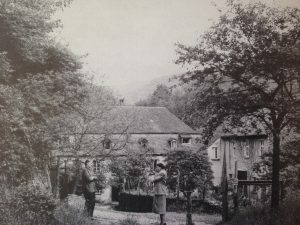 “wohnhaft zu”: “residing in/resident of”. This is then followed by the name of a city or town. 5. “Sohn/Tochter des_____”: “son/daughter of the______”. This line is normally followed by the occupation of the father, the father’s name, his wife and his wife’s name. If the parents are deceased or if there is any other relevant information about them, it is also mentioned here. 6. 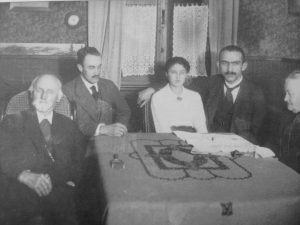 “Zeugen”: “witnesses”. The name, age and occupation of the witnesses, as well as how they were identified, are listed underneath the witness section (usually the second page of the marriage certificate). 7. “Vorgelesen, genehmigt und unterschrieben”: “Read aloud, approved and signed”. The names of the newly-married couple, as well of the names of the witnesses, are signed underneath this phrase. With these tips, deciphering marriage certificates should become a little bit easier. And if you would like to consult a professional translator, don’t hesitate to contact me here – I would be happy to be of service. 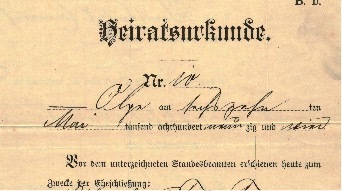 I am having a hard time reading the old German script on what I believe to be my grandparents marriage certificate. It says Befcheiigung der (and then what look s like ” Chefchliefzung” which is not a word I can find anywhere. It has both my grandparents’ names listed on it. Can you help me figure this out? Thank you for your comment. Can you send me an e-mail to language@sktranslations.com and we can go from there? 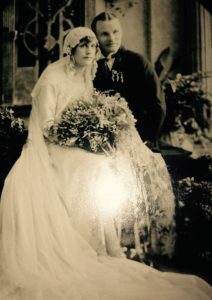 I too am researching my great grandparents wedding certificate. 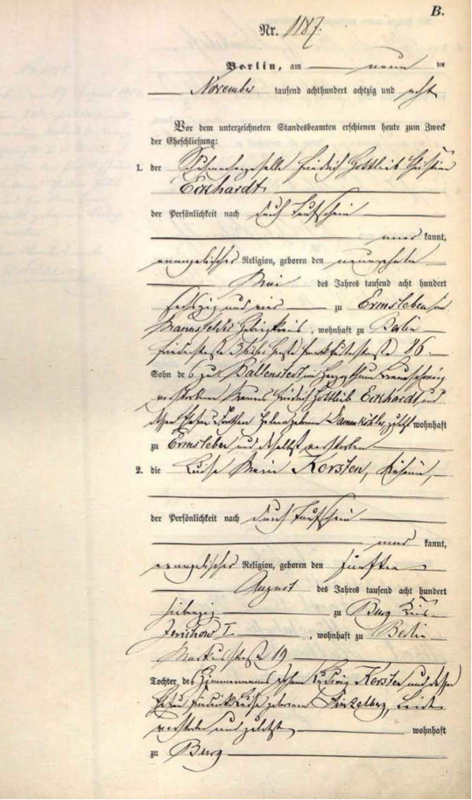 I believe what you are trying to translate is Bescheigung der Ehschlieβung which means Certificate of the Wedding. If you’re still looking for an answer, it’s “Bescheinigung der Eheschliessung” (= certification of the marriage). You’re right, it’s a marriage certificate. The letter “s” often looks like an “f” in old documents. I know the document I have is my great grandparents marriage certificate but I cannot read what the last name of my great grandmother is.